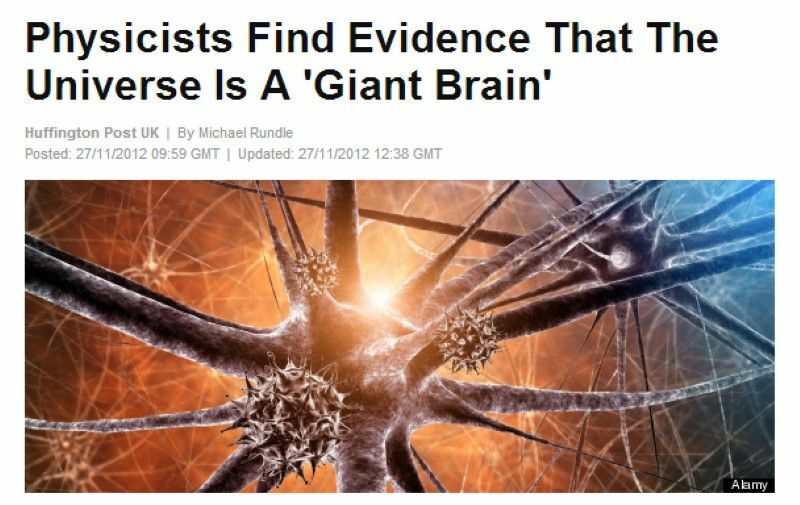 But now physicists say there may be some evidence that it’s actually true. In a sense.According to a study published in Nature’s Scientific Reports, the universe may be growing in the same way as a giant brain – with the electrical firing between brain cells ‘mirrored’ by the shape of expanding galaxies.The results of a computer simulation suggest that “natural growth dynamics” – the way that systems evolve – are the same for different kinds of networks – whether its the internet, the human brain or the universe as a whole. According to a study published in Nature’s Scientific Reports, the universe may be growing in the same way as a giant brain – with the electrical firing between brain cells ‘mirrored’ by the shape of expanding galaxies.The results of a computer simulation suggest that “natural growth dynamics” – the way that systems evolve – are the same for different kinds of networks – whether its the internet, the human brain or the universe as a whole. The team’s simulation modelled the very early life of the universe, shortly after the big bang, by looking at how quantum units of space-time smaller than subatomic particles ‘networked’ with each other as the universe grew.